The U value for a timber frame roof (Part L 2011) is 0.16 W/m2K; this is very close to the passivhaus standard of between 0.10 - 0.15 W/m2K. When we examine this detail we can discover heat loss through the structure mainly due to the levels of insulation and the poor level of airtightness. 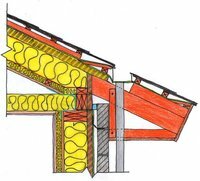 With regards airtightness timber frame can be quite difficult to make airtight. There are many methods that can be used to make the structure airtight such as use of OSB boards or airtightness membranes however this relies on high quality workmanship and attention to detail; every joint must be carefully taped or sealed (with mastic) to ensure it is airtight. The Irish standard (Part L 2011) for airtightness is 7 m3/h.m2 at 50 Pa (seven cubic metres of air change per hour for every square metre of floor area when the difference in air pressure between inside and outside is fifty Pascals), this is quite a low level of airtightness when compared to the passivhaus standard of 0.6 m3/h.m2. This portrays the difference in the level of detailing and quality workmanship needed to achieve the passivhaus standard. The sketch below is a Passivhaus detail; compliments of Integrated Energy, Crean Salley Architects and Shoalwater Timber Frame. 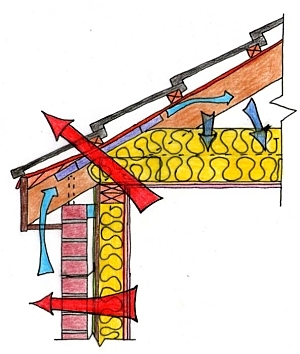 In this detail thermal bridges and air leakage which are evident in the traditional timber frame construction are eliminated; this provides the structure with the opportunity to reach the passivhaus standard of between 0.10 - 0.15 W/m2K.